False teachers who preach Jesus Christ don’t resemble Him at all. They may talk about Him, but they look like the world, appealing to its credentials and ways in order to attract converts and followers. It’s a twisted bait and switch where you get what you want, but not what you need. Could you please comment on two well known Christian Teachers, and your opinion on their being false teachers or not? I am referring to Ravi Zacharias, and Wayne Cordeiro. Thank you, and may God Bless your ministry. 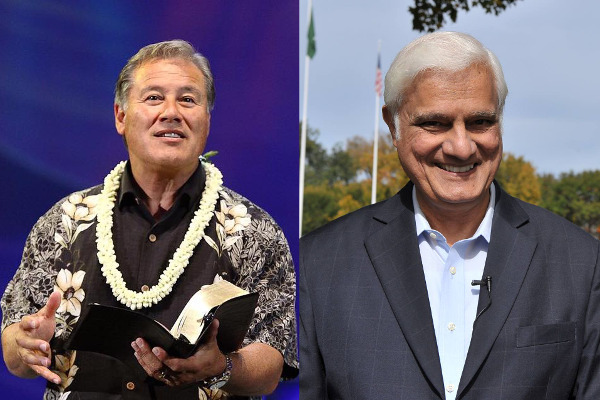 Ravi Zacharias and Wayne Cordeiro are not men of God. Here’s a sample from Wayne Cordeiro: Pastor Wayne Cordeiro on Family. In this video, he says the true priorities of life are God (he got the first one right), then spouse, children, and vocation – in that order. Is that necessarily true? In earthly terms, perhaps, but what if God calls one to ministry as his vocation? When Jesus Christ calls a man to the work of the Kingdom, that calling comes before spouse and children, does it not? That said, I think Wayne means his family comes before his job, if a secular, income-earning occupation, so I concede there. Even so, isn’t it God Who must decide what or who comes first? And isn’t it true that every believer is called to forsake everything to follow Him, even as Jesus declared? See Choose This Day Between Family and God. Cordeiro and Warren preach another gospel; it’s all about the social graces and etiquette the world practices at the cost of truth. There is no cross whatsoever involved. The Message or Gospel of God and His Kingdom begins with the cross, calling one to repentance and confession of sin by His standards and ways. Zacharias, Cordeiro, and Warren are loved by men; they are popular, commended, and promoted by the world. You see that Ravi Zacharias had the title of “Doctor.” Who gave him that title? Was it Jesus Christ? Did Jesus call His disciples “Dr. Simon Barjona,” “Dr. John the son of Zebedee,” and “Dr. Paul of Tarsus”? Did Paul call his disciple Timothy “Reverend Tim”? Did even the Lord Himself carry a title? Jesus had no degrees or doctorates. Why? Because God was demonstrating that the Kingdom of God is not of this world – it doesn’t come through excellence of body or mind, skill, education, or training in achieving the praise and honor of men. Don’t these men come in excellency of speech? What does the apostle Paul say of this? These men have the mark of the beast so that they are free to buy and sell, received and admired by the world. And what does Jesus say about that? “And being money-lovers, all the Pharisees also heard all these things. And they derided Him. And He said to them, ‘You are those who justify yourselves before men, but God knows your hearts. For that which is highly esteemed among men is abomination in the sight of God’” (Luke 16:14-15 MKJV). Read all of the Diabolical Doctrines and The True Marks of a Cult. In these writings you’ll find a multitude of indicators warning you of things not right with these men. If you have any questions after reading, let us know. Not only has Ravi Zacharias promoted himself as a man of God using the worldly title, “Doctor,” in total contradiction to the Word of God and His ways, but it has now been brought to our attention that Ravi has even lied about his earthly credentials. Or how about in the modern vernacular? “You’re hopeless, you religion scholars and Pharisees! Frauds! You’re like manicured grave plots, grass clipped and the flowers bright, but six feet down it’s all rotting bones and worm-eaten flesh. People look at you and think you’re saints, but beneath the skin you’re total frauds” (Matthew 23:27-28 MSG).